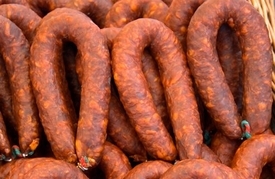 Chorizo is a chile (pepper) and garlic flavored sausage. Chorizo originally arrived with the Spanish Conquistadors but has evolved into a distinctly Mexican sausage during the last several hundred years. Chorizo is great for breakfast or any other meal. Fry it up, scramble in some eggs ... and you have chorizo con huevos! You can follow the recipe below, or just purchase one of our ready-made Chorizo Seasoning mixes (scroll down to see links).